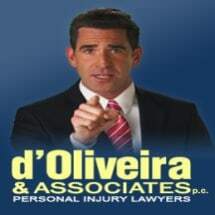 Committed to providing the highest level of advocacy possible for those living and working throughout Western Massachusetts, d'Oliveira & Associates P.C. in Attleboro, Massachusetts, focuses solely on helping our clients obtain the maximum amount of compensation possible for the losses they sustained through someone else's negligence. At our law firm, we handle only personal injury, workers' compensation and Social Security Disability benefits claims. This means that we possess the extensive resources required to handle your case regardless of how complex or challenging. Having recovered over $200 million for those we have served, our law firm has become the trusted source for high-quality, effective legal counsel to those in need. Each of our lawyers has at least 20 years of experience handling all types of disability and injury claims, and combined, we possess nearly 100 years of legal experience among us. To put this level of experience and client commitment to work for you, we invite you to contact our law office or visit our website to receive a free initial consultation concerning your case. At d'Oliveira & Associates P.C., we understand what you are going through, and we promise to work closely with you to help you secure the finances you need to support yourself and your family while you focus on your recovery. d’Oliveira & Associates’ new Woonsocket, RI Personal Injury Law Office is located at 62 Hamlet Avenue, Woonsocket, RI 02895. The move will enable the Firm to maintain closer contact with its clients in the Woonsocket, RI area. If you have been injured in a motorcycle accident in the Attleboro, Massachusetts area, you may be entitled to a cash settlement for your medical bills, lost income and pain and suffering, among other losses. If you have been injured while working in Attleboro, you may be entitled to workers’ compensation benefits for your lost wages, medical bills, job retraining and in some cases, a lump sum settlement, among other losses. If you have been injured from a slip and fall accident in Attleboro, you may be entitled to compensation for your medical bills, lost income and pain and suffering, among other losses.